By partnering with IKEA US, Goodwill Industries of Metropolitan Chicago will offer a simple and rewarding solution for donating used furniture. During its first annual furniture take back held in conjunction with IKEA's "Sustainable Living Your Way" event on Earth Day, Saturday, April 22, representatives from Goodwill will be on hand at the Bolingbrook and Schaumburg IKEA parking lots between 10 a.m. and 6:00 p.m. to accept your furniture donation and issue important tax receipts. As a reward for your generous donation, you'll earn a coupon for $20 off an IKEA purchase of $150 or more, valid April 22 through May 21, 2017 (limit one per household). The furniture received at IKEA "Sustainable Living Your Way" events and sold at Goodwill stores will be used to create job training and placement opportunities for people in local communities and throughout the United States, helping people find jobs, earn paychecks, and build their skills and credentials. Items accepted at these Earth Day events include bedframes, bedside tables, dressers, bookcases, armoires, dining tables and chairs, sideboards, desks and desk chairs, file cabinets, sofas, coffee tables, side tables and other furniture products from any brand or maker. Items not accepted through the IKEA/Goodwill furniture take back include mattresses, bedding, children’s furniture and used children’s products or toys. We are so pleased to be a part of this inaugural program! Please join us as we celebrate Earth Day and support IKEA and Goodwill’s joint mission to promote sustainable living and strong communities. Two participating IKEA locations are: 750 E. Boughton Rd., Bolingbrook, IL and 1800 E. McConnor Pkwy., Schaumburg, IL. 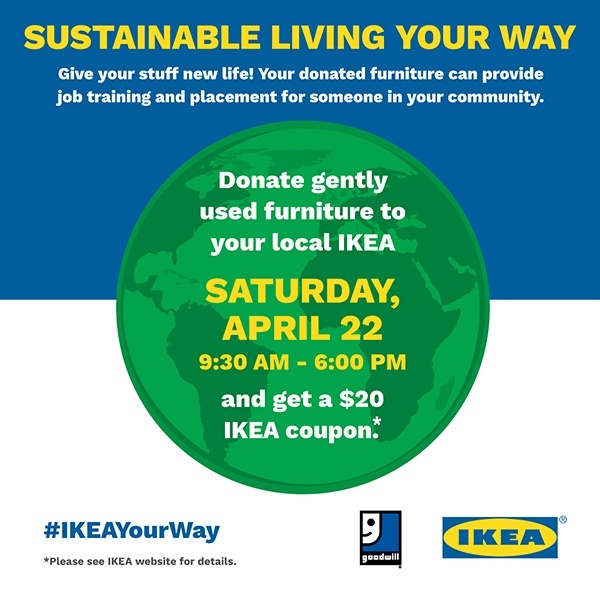 Or, to find the participating IKEA store near you, visit https://info.ikea-usa.com/Sustainable-Living-Your-Way.